Just a few months ago, your little bundle of joy was in your womb and you were wondering how he/she would be and how you would feel once he/she comes into this world! Now your little baby is one year old and yes, it is a big deal! Some people tend to go all out of the way and spend huge amounts to get that perfect birthday; while some work on a budget and still get that perfect first birthday for their little one. If you too want inspiration for some first birthday party ideas, you’ve come to the right place. There is so much to look at when organising the first birthday party. From the venue, to food, to dressing up your child to the guest list, to decorations, invites and most importantly the cake and the budget. Obviously, your little one will have no say in the choice of his/her birthday, but you are the one making it the perfect party for him/her. A favourite among parents of girls, little girls look too adorable in little tutus and tiaras on their heads. It can be made into a Princess theme as well with purple or pink colour schemes and flower decorations. Your guests too can wear tiaras. Hello Kitty is a very famous brand that has been making its presence all over the world. Your little one too can be dressed up as kitty and you can have kitty masks and kitty giveaway for your guests. Kitty cake and cupcakes can be made very easily. 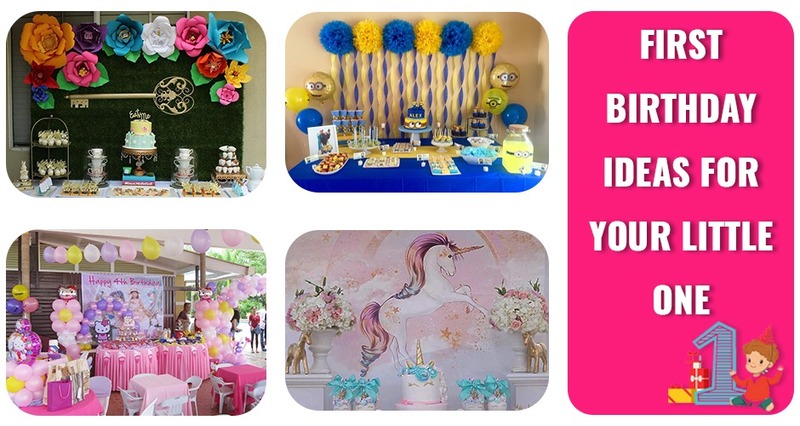 This can be a magical party for your little one with Unicorn figures all around. The colour theme can be white and pink and unicorn heads can be put up for decoration and masks. Every child’s favourite is balloons and the favorite of girls is flowers too. This can be a very colourful theme for your little ones first birthday. Beautifully flower decorated cake, a flower tiara and flower accessories for your baby can make it a beautiful birthday. You can recreate the long dining table here with your friends and guests and have a mad hatter party. There can be pretend tea and cake for all to play. Your little one can be the Alice while you create the magical world around her. This will cost a bit, if you have the budget for it. Stars and galaxies can be the theme for this silver coloured party. Star-shaped balloons can be everywhere with moons and stars to decorate the area. The cake can too have little stars on it and your dude can dress up as the main star of the party. Minions have become quite famous among children and with their wonderful tone and talking abilities they make for a fun party idea. Minion cake looks too cute and your little one will be surprised by it. You can even plan a cake smash with this one. Little boys love aeroplanes. You can recreate an aeroplane theme and have your children sit with seat belts on and recreate an aeroplane ride. They can buy pretend tickets and look for their seats and you can serve refreshments on the seats. This can be a cute little party where your kid can be the little Christopher Robin. You can recreate animals and Pooh’s friends. With woodland creatures it can be an exciting party with the lovely cake and a forest theme. Little boys love everything with wheels. They see big trucks and cars and get excited. You can plan a party around the four wheels and have various transportation options. The cake can also be a car shaped one. You can also order a small car or jeep ride for children if it is in your budget. All kids love to see a little bit of a clown and a little bit of magic. You can even dress up your little one as a small clown and everyone else can be dressed up as circus characters. Who doesn’t love animals? With an animal themed party, it becomes more fun as you can dress up your kid in their favourite animal costume and have a cake with all animals on it. There can be animal songs and stories around your child’s birthday. This can be a very colourful idea with all the colours of the rainbow as part of the decoration. A rainbow cake is also very famous and your child will love the colourful surprise. Have various Disney characters and especially the characters that your child loves. Famous among them are Mickey Mouse, Donald Duck, Tom and Jerry and so many more. You can have a cake of your child’s favourite character. Children love the outdoors and they love to play outside. If the weather permits then you can have a nice picnic party outdoors. All children, including your little one, are definitely going to enjoy themselves.